Which ethnic community in the UK suffers the most abuse do you think? Nine out of 10 children from this community have suffered racial abuse, and two thirds have also been bullied or physically attacked and are scared to go to school. How do you feel about that? Which community are we talking about? Friday’s Guardian ran a report entitled, “It’s time to end ‘the last acceptable racism’ – against Gypsies and Travellers” How do you feel now you know? Shocked or not surprised? Having been bullied at secondary school myself I have a low tolerance of bullying when I witness it – and intervening gets me into trouble sometimes. And having helped raise three lovely daughters, I have a low tolerance of discrimination against women as well. Our common imago dei – that is – that we are created in the image and likeness of God means that it is sub-Christian to mistreat, abuse, or denigrate any person, irrespective of their race, colour, age, religion, gender or sexual orientation. Let me repeat that. 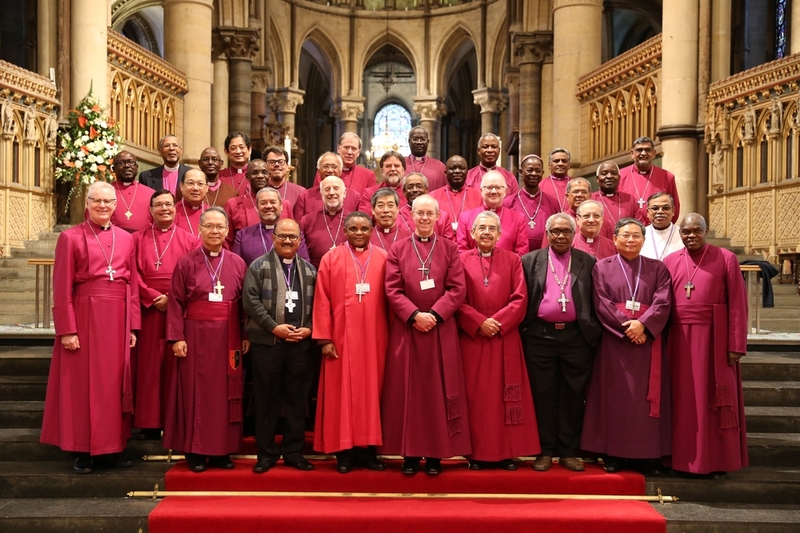 That is why I am glad the final Communique of the Anglican Primates meeting in Canterbury last week, spoke compassionately about another group who suffer abuse. The Primates concluded their Communique with a reaffirmation of the gospel of our Lord Jesus Christ. The theme of the Conference was “Walking Together in the Service of God in the World”. The controversy surrounding the Primates meeting had to do with conflicting, mutually exclusive definitions of the gospel – “the truth revealed in Jesus Christ”. Clearly the Primates and the Provinces they represent are not all “walking together” and this was formally acknowledged. Played out before the world’s secular media I believe the final communique was gracious but essential. The greatest sin you can commit today it seems is offending people. The temptation therefore is to soften the gospel. How can we avoid being offensive while sharing our faith? How do we share our passion without prejudice? Our convictions with compassion? In our Bible reading today we observe Jesus doing so and showing us how. As people encountered Jesus, three kinds of faith were exposed. Only one will do. Doubting Faith, Unbelieving Faith and Saving Faith. Lets consider each and decide which one best describes yours. Which of the three are you relying on today? Jesus returned to the community in which he had been raised as a boy. Even though just a year before He had been ejected from the synagogue (Luke 4:16-30). He probably knew everyone in that small town by name. This time, they did not evict Him: they simply did not take Him seriously. Asking questions but not finding answers. Two things amazed them: His miracles and wisdom. Jesus claims to have existed before the world was created. He claims to be our creator. He claims to be both God and man. He claims to have come to earth to rescue us from sin and evil. He claims he will come and live with you to enable you to become like him. He claims to hold your eternal destiny in his hands. If you don’t find that amazing, if you have never had any doubts about these claims, then perhaps its time to join our next Christianity Explored Course starting Thursday 4th February. Jesus invites analysis. The value of doubt is that it can detect error. All is not true, so not everything should be believed. Doubt is the acid test for truth. Doubt is the best solvent for error. It is the Geiger counter for detecting falsehood, the sieve to catch unwanted lumps of irrationality. Doubt acts like a sparring partner to both truth and error. It keeps faith trim and helps shed the flabbiness of false ideas. Like a terrier, doubt worries at weak ideas until they escape reinvigorated or collapse exhausted. If anyone says “Just believe” don’t. If anyone has to say “Don’t you trust me?” Ask for proof. I encouraged my children to question assumptions, to test theories, to doubt strangers. And I encourage you to do the same. But I also invite you to consider the wisdom of Jesus; consider the miracles of Jesus and ask yourself the same question these Nazarenes asked, “Where did this man get these things? What is this wisdom that has been given him, that he even does miracles!” But don’t be satisfied with a doubting faith based on rhetorical questions. Search for an answer until you find it and test them until they become your personal deeply held convictions. The search for an answer will lead a doubting faith in one of two directions. The facts will either drive you to a saving faith or an unbelieving faith. For Jesus demands a response. He calls us to repent, to trust and obey, to surrender and follow. Jesus calls for a whole change of lifestyle from what we want, to what he wants, and that isn’t popular. A doubting faith. A good place to start, but not to remain. We could debate the relative merits of these beliefs. The issue that cuts through all the fog is what are we to make of Jesus Christ? And that brings us back to our story. What was the problem for the Nazarenes? Why were they unable to trust Him? Because like many people today, they thought they knew who Jesus was, when in fact they didn’t know him at all. They asked the right questions but with the wrong attitude. In Mark 7:13 he added, “Thus you nullify the word of God by your tradition that you have handed down. And you do many things like that.” (Mark 7:13). These people were very religious. They attended services in the Temple or the Synagogue. But they preferred the views of their contemporaries over the Word of God. This is why Jesus was amazed at them. That is why Jesus offended them. He called them hypocrites. They believed one thing and did another. The kindest, most loving thing Jesus can say, is the truth. People will be offended by the gospel. Just make sure it is only Jesus who offends them, not our behavior or lack of compassion. This passage also shows that it is futile to argue with someone who will not face the facts, because they are no longer looking for an answer but for an excuse. So don’t give them one. In Nazareth, just as in Virginia Water, there were some who had a doubting faith – they rightly questioned Jesus. But among some it became an unbelieving faith. The hypocrites were offended by Jesus. There is a third kind of faith demonstrated in this passage. It’s there – can you see it? Mark 6:1. “The Disciples followed Jesus.” Don’t ignore these profound words. Obedience to the Son of God is the path to saving faith. Jesus is making it very clear that it is following him that we experience a saving faith. On another occasion, Jesus made his own words the test of faith. Faith is never static. It is either growing or shrinking depending on how close we stay to Jesus. The disciples followed Jesus and saw his wise teaching and compassionate miracles transform the lives of those who trusted in Him. Jesus was inviting experimentation among those who had already begun to believe in Him. Following Jesus Ignites an Infectious Faith. Jesus began to train them, instruct them, trust them, delegate authority to them, and share his ministry with them. This was a short term training exercise. In the last week of his life on earth Jesus gave them another set of instructions because they were not coming back. What did Jesus commission them to do? Demonstrate in word and deed that the Kingdom of God had arrived – preaching repentance, driving out demons and bringing healing and wholeness to the sick and disabled. Liberating especially the marginalized, the poorest and oppressed from sin, from sickness and from Satan. A foretaste of heaven. Does following Jesus ignite your desire to share your faith? On the back wall are a list of the ways we seek to serve one another and reach our community. We expect everyone who is following Jesus to serve him on one or more of our teams according to our talents and abilities. If you are not, then lets have a conversation. The qualifications are simple. A saving faith. A servant heart and a compassion for all but especially the most vulnerable. Today we have considered three kinds of faith. Only one will do. A doubting faith is a good place to start but an unbelieving or hypocritical faith will not do. Make sure yours is a saving faith, a deepening faith, an infectious faith. A faith that is placed firmly and securely in Jesus Christ, our Saviour and Lord. Let us pray. This entry was posted in Anglicanism, Bible, Church of England, GAFCON, Sermons, Theology on January 16, 2016 by Stephen Sizer.